Guayabera 3/4 Women. Linen Guayabera for Ladies. Linen Suit for Wedding. Light Blue Color. Back Orders or Demand. ~Guayabera 3/4 for ladies ~Linen Regular ~Beautiful Colors ~Plus Size. Ladies Guayabera Blouse. Delicate wash. Hand wash. Dry Clean for best result Available is subject to change. Size Chart available in the footer. 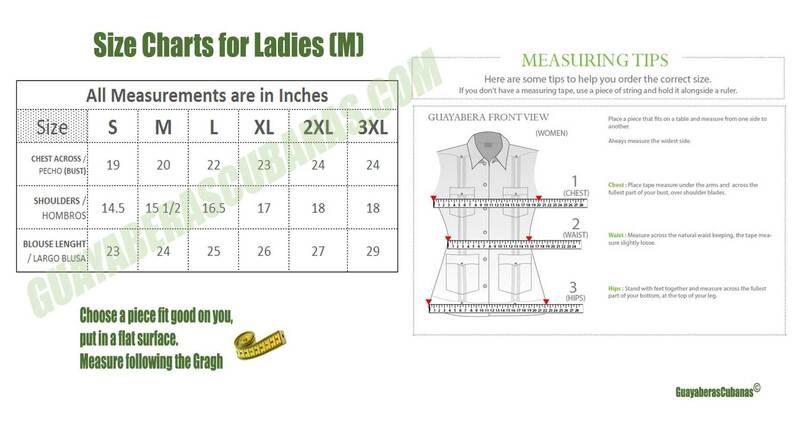 Measurements in inches (Across the CHEST) Medium: 21" Large: 22 " XL: 22,5 " 2X: 24 " 3X: 24,5"
You're reviewing:Guayabera Women. 3/4 Sleeves. Linen Guayabera for Ladies. Aqua Color. Guayabera Women. Sleeves 3/4. Linen Guayabera for Ladies. Salmon Color. Guayabera Women. Sleeves 3/4. Linen Guayabera for Ladies. Red Color.